Piraeus, Greece - Hundreds of farmers from the island of Crete battled riot police at the port of Piraeus, near the capital Athens. The farmers arrived on board three ships, bringing 300 pieces of farm equipment such as tractors, which they intended to use to create a convoy to Athens to demand aid from the government. Farm vehicles are barred from the capital's roads, and wound up being used to try to smash through police barricades at the port's gates. 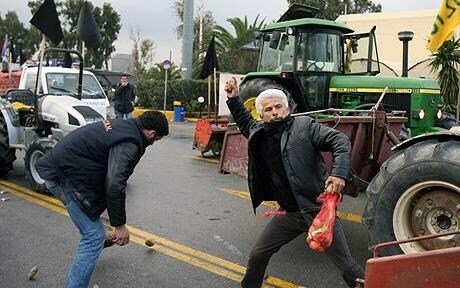 Farmers also pelted police with potatoes and struck them with crooks, traditional tools of Greek shepherds. Thousands of farmers have been protesting across Greece since Jan. 20, blockading the country’s main roads. Most of the blockades were removed last week, although one remains on the border with Bulgaria. Greek farmers’ income has shrunk by almost 24 percent in the last decade, according to their labor union. On the same day in Athens, about 200 protestors smashed their way into Athens City Hall and interrupted a city council meeting to express displeasure with the felling of trees and destruction of a public park to build a parking garage in the Kypseli neighborhood.